Looking to Partner with Love INC? Be treated like a person, not a need or a case number. Find lasting help when unemployed, disheartened, lonely, and desperate. Receive real, holistic, practical help for real needs. Experience life-changing relationships with Christians. See local Christian churches working together. Realize that God is love and that Christ loves them. Know that Christ truly saves (in all ways) as the churches claim. Learn who God created them to be. Know that God’s love gives solid hope. Love In the Name of Christ is uniquely designed to meet the deepest, real needs of our neighbors. Love INC responds to these needs, along with the material needs, of people in our community who struggle with life’s challenges. Move beyond offering just financial help. Verify that requests that come to you for help are legitimate. Serve others without creating dependency. Be unburdened of trying to respond to every type of need by any one church. Discover root causes of chronic problems and dysfunction, and respond to them. Proactively connect with neighbors in need. Develop Christian relationships with neighbors. Become aware of unmet needs so the church can offer help, healing, and Christ’s love. Transform lives and the community. Existing resources operating independently are inadequate to meet current and growing levels of need. One church alone cannot deal with all the complex issues of real people who are struggling with all types of hurt, brokenness, dysfunction, or poverty. It takes churches, working together, across denominational lines, to meet these multi-faceted needs. Live Out Your Faith. Lovingly Serve. Without volunteers, there is no Love in the Name of Christ. 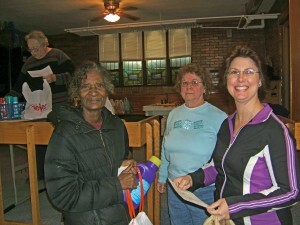 Volunteers are at the heart of our Love INC ministry. Love INC exists to help Christians put their faith into action as they serve their neighbors. Whether you are on your own, as a family, a church, or in a small group, let us help you find a place to use your gifts and talents. We’d love to have you join us! Based on the gifts and talents you have to offer, we will find a place for you to volunteer and serve God through Love INC. There are so many different ways to serve. Please touch base and we’ll find a place where you will fit in to be the hands and feet of Christ in our community. Church Ministry Coordinator – contact person who is the vital link between their church community and Love INC – inform, recruit and encourage volunteers, keep church informed of Love INC ministry, opportunities and the needs in the community as well as informing Love INC of talents and passions for ministry in the church. Looking to Help Those in Need at Your Gate? Love INC removes the burden of verification so that you can focus on meeting legitimate physical and spiritual needs. We can also help you mobilize your congregation to reach out by identifying talents and providing service opportunities in your neighborhood. You can refer people in need to Love INC right away and contact us to learn more and/or set up a presentation for your church. Love INC connects legitimate needs to resources in the community. We bring churches, businesses, agencies, and individuals together to solve crisis needs. We validate that needs are legitimate, preventing resources from going to non-legitimate needs and make sure resources aren’t duplicated.